We begin with A Gift" which is a composition of whistles and highly processed accordion--immediately the recycling projects of Vidna Obmana, for example Landscape in Obscurity, come to mind. Gradually the accordion tones build up to form a harmonic mass of sound, rapturous in tone. Pretty good for an accordion! The next two tracks launch right into traditional Alio Die territory--repeated "melodies" featuring processed traditional instruments alongside rich organic drones. This is what we've come to expect and love in an Alio Die CD. 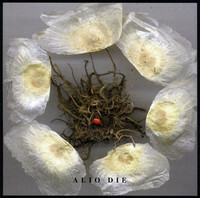 Alio Die has mastered this type of composition--not to mention the fact that the types of tracks he does are unmistakably Alio Die. There are not nearly enough Alio Die discs to be tired of the style yet. The attention to mystic tone is so deep that it is hard to not be entranced even with minor stylistic tweaks to the Alio Die-style proper. A standout track is "Fragile-struggente," which is a very simple mixture of melancholy synth loop accompanied by the sound of a lemon peel burning on a stove (according to the liner notes). It's a gorgeous little piece, with incidental noises and creaks that remind me of Ora. It's tracks like this that have beguiled me with Alio Die from the start. A simple setup leads to pure ambient ritualism. A still later track, "Still Here!" reminds us that past drone albums are not far off--I would not be surprised if this were an outtake from Incantamento. I have always imagined Stefano Musso as some crazy Italian guy making ambient records out in the middle of nowhere. Sure, he's got an email address, but who's to say this isn't some strange sham? Whenever I pop in the Alio Die album of choice, it's not idle soundscaping with strange noises, it's not a journey into deep, dark space like so many other ambient releases fine and not so fine. This is the sound of a man with wild hair performing a magickal-with-a-'k' ritual on the top of a mountain amidst blowing crosswinds. As we all well know, black magic is not performed without consequences--Musso has tapped into some leyline of arcane energy, and it's seeped into the music."